Blinked twice ... still there ... slug of coffee ... still there ... a protest ? No quite but ... family carers do get a mention ! Protest rally plan over free bus passes as state pension age changes. Members of The Women Against State Pension Inequality (WASPI) group will have to wait several years for their pension following the Government's decision to raise their retirement age to 66 by 2020. Many have been left without an income or the ability to travel and Birmingham Council leader Ian Ward recently requested free bus passes for WASPI women at a West Midlands Combined Authority (WMCA) board meeting. This was the third time in the past year that the Mayor had been asked directly about the issue, after being handed two letters by the group in December and May. The Mayor has said he will continue to consider the case. But group co-ordinator Bridget Green says that they are undeterred by the unfavourable response, planning to hold a rally in support of WASPI women in two weeks' time. "Free public transport is an issue that WASPI, together with Labour MPs from Birmingham, have been fighting for," she said. "In May a group of us presented yet another letter to Andy Street. We have not had a response, although on the day he said such issues are always under discussion and reminded us that he had introduced bus passes for apprentices and young people. "Birmingham Council have pledged their support for the WASPI issues and this is one way they can help us. "In April this year Andy Burnham, Mayor of Greater Manchester, introduced the bus pass for women born in 1954. The bus pass is also available for people over 60 in Scotland, Northern Ireland, Wales and London. "Women born in the 1950s have been severely affected by changes to their State Pension Age of up to six years, 37,000 in Birmingham and around 220,000 in the West Midlands. Many of us received no notice of the changes and most only received two years notice of the enormous increase. "Why do you think shops such as M&S are struggling? We cannot afford to get to the shops let alone spend. "We are holding a rally in Eastside City Park on July 14 to raise awareness, in particular of the effect this is having on our families. "People are having to work instead of helping with child care, or are living off dwindling savings, selling houses, signing on you name it. "We deserve better, and we are not asking for something for nothing. We have contributed to society, for 46 years in my case, and now we're having to sign on. It's unbelievable. "I did ask Andy Street about this issue during the hustings, prior to his election, and it was ignored then as it is now. "But as us WASPI's say - we are not going away!" Responding to Cllr Ward's request for free transport for carers and WASPI women Cllr Lawrence, who holds the portfolio for transport, said: "It is something which I think we all have a lot of sympathy towards. "There are two complicating factors at the moment. One if, that unlike some of the schemes our scheme also involves a rail pass, and we would probably need to do something that was bus only, and that would fit in along the lines of the national scheme. "There may be an issue over whether any action could be seen as breaching discrimination laws, and that needs to be tested out. "But the final barrier of course is that it would need to be paid for. And last year I'm very pleased to say that district councils received a little bit of a bonus in the reduction of the levy for transport. "If this is going to be introduced both for women and for carers, which again is something I think is well worth investigation, we need to recognise that it will involve some costs, and will involve looking again at the rate of the levy." Did you spot it ? A CLUE ...in BOLD and HUGH ! Oh well , a spin off ... nothing more. Good fortune to the ladies ... nationwide ... the adverse pension changes were an abonimation. Last edited by Chris From The Gulag on Sun Sep 30, 2018 10:37 am, edited 1 time in total. I really find this new(ish) layout horribly difficult to navigate around and take in. It took me ages to locate the petition. I agree: it's absolutely ludicrous that my cared-for-person gets free travel, yet I have to pay - all for the pleasure of going somewhere I've no interest in going, and straining my muscles pushing her somewhere I don't want to go. I wouldn't necessarily ask for a blanket free pass, because I could see that could be open to abuse, but if I'm pushing someone in a wheelchair wouldn't it just be nice to be covered by her pass for those instances? Not so much the petition ( Done better than most out there ) , more of an argued case to present to Parliament ? As no one else is doing anything , including our supporting organisations , I have volunteed myself via my local mp ... as recorded earlier. After all , parity with guide dogs isn't too much to ask ... is it ? Not giving up on making this issue happen sadly not many signed lately but I’m still doing all I can to get it noticed . Even if just issue is raised at least its being spoken about and may benefit a huge amount of us . As petitions go , you've done well. Out of curiosity ... Carers Trust ... anything beyond " That sounds like a good idea ! " ... bearing in mind their links with the NUS north of the border ... and no mention of the abhorrent 21 Hour Rule on their web site ? Same with the free travel for family carers campaign ? 2018 ... not a good year for anything to ease the plight of family carers. Having said that , the past decade hasn't seen anything either. There's only individuals left trying to do something. Lost in the cacophony of noise raised to ensure that power and wealth is preserved ... at all costs ... hence austerity. That's the real enemy out there. The DWP is under fire for causing more ‘hardship’ with one of its own absurd rules. As University College London noted in 2014, the poorest in society walk the most and are most reliant on buses.
" I believe even low paid workers and carers should have access to free travel. It doesn’t pay to work part time… I saw a one worker have to pay £8.00 for a taxi to work because village bus didn’t turn up. She literally had to pay her travel out of her benefits. " Every little bit helps ? Just an Update on Amanda's petition. 4.877 signed as I type. 7.8 million family / kinship carers ... a third or more would benefit directly. Yesterday's way ... for more than a decade. Whatever works ... yet another conundrum. Parliamentary route still blocked ... not the time to approach local mp. Annual pantomine time shortly ... Party conference season ... preaching to the choir. Talking of which , CUK agm in November ... whoopie ? Tread water yet again ? Victoria's carers are being promised a $49.5 million boost to respite programs and expanded eligibility. Victoria's carers are being promised a $49.5 million boost to respite programs and expanded eligibility by the state government. Labor has promised the funding, which it says will allow an extra 5000 carers access to respite services, if it wins the November state election. It has also promised more support services for under-recognised groups like young and LGBTI carers and half price travel on public transport all year round, as well as free travel during Carers Week. There again , once in power ... ?
" What we meant to say was ... etc. etc. " A PROPOSAL to restrict free bus travel for the disabled, which could save the council £400k, was slammed an ‘attack on the most vulnerable people in society’ by protestors outside the Civic Centre on Monday. Disabled People Against Cuts (DPAC) Berkshire and Reading Trades Union Council (RTUC) held a third protest against Reading Borough Council’s (RBC) proposals to restrict free bus travel for disabled people and their helpers in Reading. Councillor Tony Page, lead for strategic environment, planning & transport, said the cuts could save £400,000 but that the precise amount is difficult to estimate. A decision on the proposal – which would see the council revert to the English National Concessionary Travel Scheme (ENCTS) – is expected on Monday September 24, at the Policy Committee. Mary Cross, chairman of DPAC Berkshire, said: “What the council do not understand is there has been one cut after another. The Council is proposing to remove all discretionary elements and revert to the national scheme, which is the legal minimum. The estimated 6,000 disabled access pass holders in Reading would no longer be able to travel for free in Reading before 930am or after 11pm, Monday-Friday, except for bank holidays. The council would also no longer issue or accept companion bus passes – which allow carers of access pass holders to travel for free – nor provide free travel on ReadiBus services. If agreed, the change will be implemented on April 1 2019. RBC reverted to the national scheme for older people in 2017. An eight-week public consultation, which received around 1500 responses, ended in July and a review will be presented at the Police committee on September 24. Councillor Tony Page said: “We are legally not allowed to run a deficit. If we do not save the 400k we will have to find the saving somewhere else. At least one manor that DOES have free bus travel for family / kinship carers ... for now ?
" 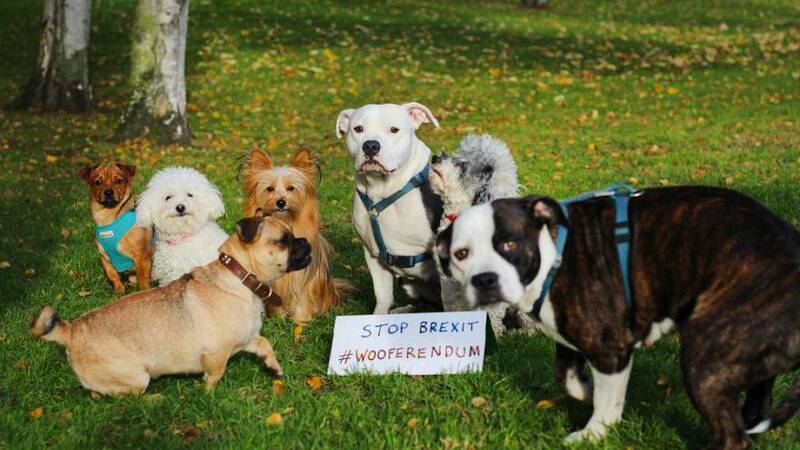 Dogs against Brexit " to march on Parliament to demand new EU referendum. I trust that the guide dogs on the march will show some solidarity ? * Free Travel On Public Transport For Our Two Legged Comrades ! " We Demand An End To Discrimination. We Travel Free , Why Not Them ? " We can only bark / wag our tails in agreement ?